Wireless charging has been a thing not so new, neither too old, nor available to everyone. While Samsung has been using the wireless charging standard Qi for quite some time, Apple has just moved onto the bandwagon with their latest fleet of iPhones. But, the fact is that wireless charging is not available to everyone everywhere and sometimes, it’s painful. You can not use your device while it’s getting charged wirelessly and neither one can charge all devices. But now, here comes the Pi – A new charging technology developed by Massachusetts Institute of Technology graduates. Pi has a cone-shaped base station and you can place it anywhere, on the desk, table or even maybe beside your bed. The procedure is also very simple. Just plug your iPhone or Android phone Pi-compatible charging case and place it within a foot of the Pi. As I mentioned earlier, there is no limitation of carrying charging docks for multiple devices as Pi can charge multiple devices at once, that is four phones charging with a 10W power supply. You can also add more devices, but they will charge slower. Pi has also mentioned that phones like iPhone 8 won’t need Pi cases. The idea is actually pretty old, and Nikola Tesla, the mad scientist was probably the first human to think about transmitting electricity wirelessly. In 1891, Nikola Tesla gave a lecture for the members of the American Institute of Electrical Engineers in New York City, where he made a striking demonstration. In each hand, he held a gas discharge tube, an early version of the modern fluorescent bulb. The tubes were not connected to any wires, but nonetheless, they glowed brightly during his demonstration. Using the funding from JP Morgan, he, with his few of the team members actually built a tower which could power up the entire city wirelessly. But, the money-minded JP Morgan made it shut down, and the rest is as you know, we’re using the Edison’s DC system for long transmission. Anyhow, the point here is, the MIT grads used the same idea as of Tesla and they have succeeded up to a considerable extent to make Tesla’s dream come true- Better late, than never. Pi uses electromagnetic charging technology- resonant induction, which is same as Qi. Pi is the brainchild of Lixin Shi, an MIT Ph.D., and John MacDonald, a physician-turned-MBA-student at MIT’s Sloan School of Management, who spent three and a half years of research to develop Pi and it’s magnetic field shaping components. The technology is similar to Qi, but with a special beam-forming algorithm that lets them shape and direct magnetic fields around the device. This allows users to put their phone anywhere near the charging base, instead of keeping the phone on the dock at some fixed position maintaining a fixed angle. At TechCrunch Disrupt, Macdonald and Lixin Shi showed users could bring a phone within a foot of the Pi to start charging and there is no restriction regarding the phone’s position and angle with respect to Pi Charging base. Smartphones have gone smarter, but what about wireless charging and maximum efficiency in charging time? How much will I have to pay for Pi? They have promised that the price would be under $200 when they start shipping. Tech enthusiasts can reserve their own Pi right now, on their official website. The first 314 people will also get a $50 discount code. Now I know why they call it ‘Pi’. 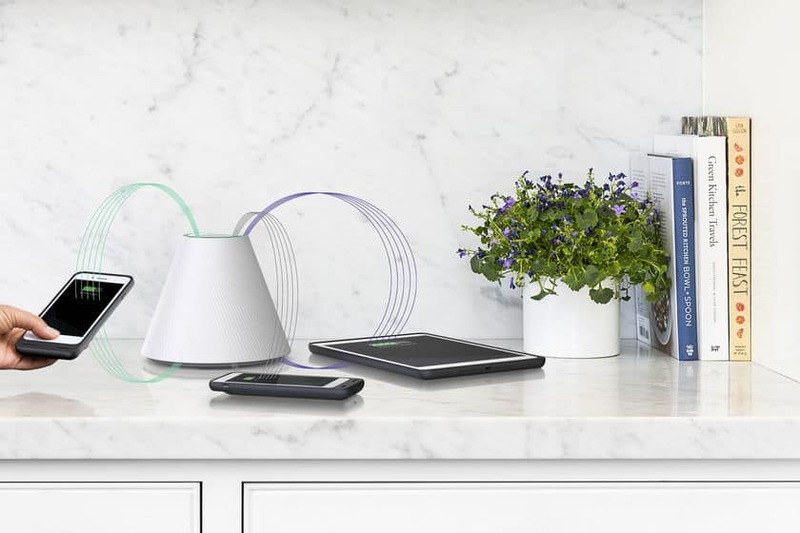 As of now, it seems quite promising with a decent price tag and the assurance of charging everything using one single wireless charging base, now we just need to see whether they improve it more or add more features like an AI assistant built in or maybe they could add a Bluetooth speaker into the dock to add more elegance and utility into the device. You have already seen the phone of the future, now get ready to see the wireless charger of the future.